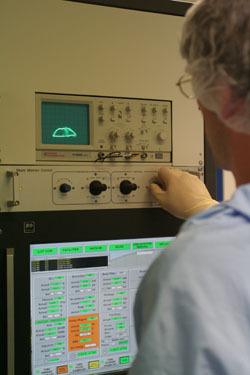 Ion implantation is use to modify the properties of a material by the insertion of ions in the volume. 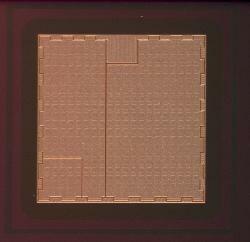 In microelectronics, it is use for doping semiconductor materials. 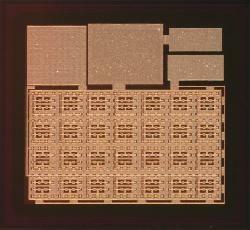 It is also used for others applications such as surface treatment. 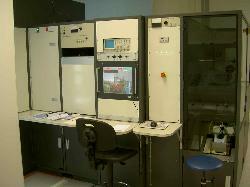 In the LAAS we have an ion beam medium current implanter. Starting from a gaseous, solid or liquid source containing the atom to be implanted a plasma is created. An electric field applied at the exit of the source extract the ions. Going through an electro-magnet these ions are selected according to their atomic mass, in order to obtain a mono-specie ion beam. Then the beam is accelerated (from 1 to 200 kV in the case of our implanter), focused and finally swept on all the surface of the sample. We realize mainly setting-up of Boron, Arsenic, Phosphor, Germanium, Silicon,Argon, Magnesium and Oxygen (Si, GaAs, etc.). The ions up to the atomic mass 125 can be treated for doses varying of 1011 ions / cm ² in some 1016 ions / cm ². 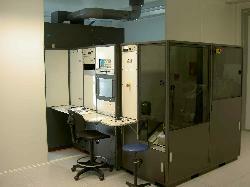 The masking is realized by photoresist. The setting-up of Boron, Arsenic and Phosphor is mainly used for the creation of the sources / drains of MOS transistors and anodes / cathodes of IGBT's components. The setting-up of Si and Ge is used for the amorphisation. We also realize setting-up low energy (10 keV) of oxygen for surface treatment applications.